Step 1 Bring wine, vinegar, mustard, shallots, salt and pepper to taste, thyme and clove to boil in covered 9-inch heavy non-reactive skillet. Immediately reduce heat to low and arrange tuna in overlapping circular pattern in skillet. Replace lid and simmer 1 minute. Remove from heat, add butter to skillet and arrange arugula on top of fish. Steep off heat, covered, 6 minutes. 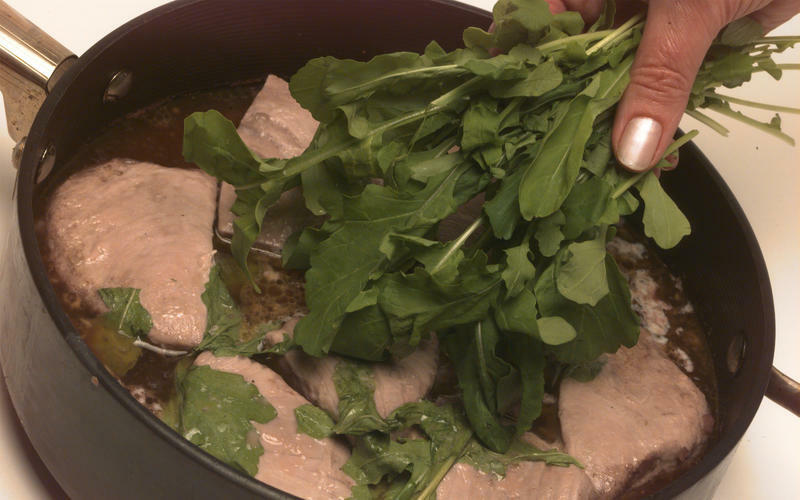 Step 2 To serve, arrange small mounds of arugula on 4 plates, place 2 pieces of tuna on each mound and pour sauce around. In Recipes-list.com we have selected the most viewed recipes from category - Fish and shellfish Healthy eating Main courses Quick and easy . Enjoy the best recipes specially selected for you! Ahi tuna steeped in red wine with wilted arugula is the right choice that will satisfy all your claims.